He also happens to be my dentist. Truth is, he didn’t used to be our neighbor. Rather, he was simply more like our dentist who Jeff and I both saw for cleanings twice a year. I liked it that way. Until about three years when he echoed my dentist from D.C. in telling me that I really needed to get a gum graft. Despite recommendations from two professionals in different cities, I think it was something about mentioning the two teeth eventually falling out that finally caught my attention. So, off I went to a periodontist for oral surgery. That was fun, as you would imagine. It was all downhill from there in the dental department, as far as I’m concerned. Subsequent cleanings occurred where I kept being reminded that I really needed to get a crown replaced from several years ago. Okay, fine. Got one crown replaced. Check. Enter period of not attending regular dental appointments as I should have due major jaw issues that kept me from even imagining a scenario where I had to keep my mouth wide open for any period of time. After some 1.5 years or so, I return to learn that I had developed some level of periodontal disease. Please return for a “deep cleaning,” I was advised. (PS – Which is painful and takes two appointments WITH NUMBING SHOTS to complete.) Frankly, I was feeling less and less enthusiastic about going to the dentist at this point. Oh, and another PS – Now you are going to need three cleanings a year to make sure your gums continue to improve. Awesome. Good thing the office is close to my house, and work. And, allow me to say that what made this all bearable is the wonderful hygienist, Connie, who works in Dr. Rodman’s office. She is actually a joy and always manages to get me talking even when I come in grumpier than grumpy because I’m at the dentist…again. Eventually I’m advised that there’s a second crown that’s failing and really needs to be replaced. More appointments. More moola. Check. Enter my last cleaning of 2012 where Connie and Dr. Rodman strongly suggest I take care of the last two crowns I have – adjacent to one another on the back upper right. Connie wants to schedule it for December. I say no – for insurance reasons and suggest sometime in the New Year instead. “First week of January?” she says. “Um, is there a rush on this?” “Well, worst case is that the tooth cracks…which, frankly, could happen soon.” Got it. So, we settle on mid-January to get both taken care of at once, which will be both efficient and beneficial because the new crowns can be developed together for a better fit. An impromptu visit that afternoon to the office reveals that I’ve got an irritated and swollen cheek from one of the temporaries. No wonder it’s hurting. Dr. Rodman shaves it down. With regard to the toothache, he’s not sure what that’s all about. Worst case: One of the teeth is “bad,” and will need a root canal to save it. A WHA? A WOOT CANAL?? At the time, I’m thinking I have no idea what that really means but all I know is that NO ONE wants a root canal. But before we go there, he wants to wait a few days for the other pain to clear up and see if we can figure out what’s going on, if anything. I very much like the waiting plan he prescribes. Meanwhile, I get some pain medication. All is tolerable in the coming days – as long as I’m constantly popping pain pills, that is. Otherwise, the toothache has taken control of my life. This Monday afternoon I went in for what was to be the appointment where Dr. Rodman would place my new, permanent crowns. That didn’t happen. Instead, I get some tapping on teeth and cold tests that were, frankly, uncomfortable on both teeth that had been worked on – but absolutely made me jump on the ceiling when he tested the very back tooth. The diagnosis: “You need a root canal for sure.” The question was: Which of the two teeth? I was having trouble determining myself exactly where the pain was coming from. Perhaps odd, but true. Regardless, with near certainty it was the back tooth that was in trouble and the one in front of it was simply referred pain, I was scheduled for a root canal at 8am this morning. I couldn’t wait. I showed up with bells on this morning. More cold tests were administered just to make sure we were getting the right tooth. (To the tune of $1K, I might mention – which would not be covered by insurance because I had already used it up with the double crown replacement.) That was (not) fun. With about 95% certainty, we both agreed that he would go for the back tooth. I’ll spare all the gory details of how long it took them to even prepare the tooth because of the small size of my mouth and my jaw issues, but let’s leave it at this: I would have rather been in a three-hour meeting about parking issues at the zoo (which is not out of the realm of possibility, by the way). Judging from the number of times Dr. Rodman proclaimed that I had a very “angry tooth” once he “opened it up,” I felt definite comfort that we had picked the right one. That was the good news. The bad: He would not do the whole procedure in one appointment because the canal needed time to medicate and heal before they could seal it up. I’d have to come back in a week or so, despite my begging to the contrary. The supposed more good news: I’d definitely have some discomfort over the next couple of days, but for the most part – the worst was behind me. So imagine my surprise when a couple of hours later I decide I’m okay to head off to work when the numbness begins to wear off and a horrible discomfort takes its place. Wow. I think I might prefer to have the normal toothache back! But what do I know…I’ve never had a root canal before. At work, I’m lisping because I realize if my teeth ever actually come together from talking – I’m experiencing extreme pain and tenderness in at least one of the top teeth. Hmmm….is this normal? I lisp my way through a staff meeting and then head to my desk to call the dentist’s office, who suggest I come back in to be checked out. One exam later – Dr. Rodman – who had left the office for the day – is being called back to take a look at my apparently swollen mouth. A couple more painful tests later, the diagnosis: the other tooth is also infected, or “hot” as they apparently like to say in the business. So, here I am. Vicodin, 600 mg. ibuprofen (which I actually borrowed from my sprained ankle prescription) and antibiotics in hand, writing this post and still numb at 10:30pm from the mega shots I got this afternoon. 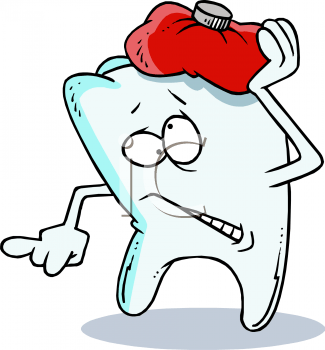 Provided my dental emergencies are over and all starts healing as it should, I’m due back in early next week for a quick check on how I’m doing, followed by a lengthy appointment the following week to finish up the root canals on the now two neighboring teeth. If all goes as planned, a week after that I’ll return for what was originally supposed to happen this week – which is placement of my permanent, new crowns on both of those teeth. After that, I’m hoping to never see my neighbor again. Or, at least until I go in for next periodontal cleaning in March. This entry was posted in That's Life and tagged health by burpobanter. Bookmark the permalink. Just read this piece. Given the fact I’m scheduled for a root canal on Monday, your experience did not put me in an upbeat mood about this whole venture. Sorry to hear about all your dental issues. This is one thing you didn’t inherit from your mother. I think her teeth are the only healthy part of her body. If I recall correctly, she has only had one cavity in her life. Good luck on the remaining visits. Not a good thing when everyone in the dentist’s office knows you so well. Ouch, ouch, ouch! As I read your account I had sympathetic pains. [Makes the colonoscopy I had yesterday — and the worst part, the prep for it — seem easy!] I pray that from here on out the rest of your current dental experience will be smooth and easy going — and then with only checkups and cleanings for many years.